M-STEM 2017 Materials And Beyond! Thomas Nelson Community College (TNCC) hosted the 30th annual Materials in STEM (M-STEM) Workshop 2017 in Hampton, Virginia on November 6 and 7. 107 participants enjoyed two full days of active engagement in materials science. They came from community colleges, universities, teachers of grades 8-12, government, students and industry; all gathering at TNCC for professional development. 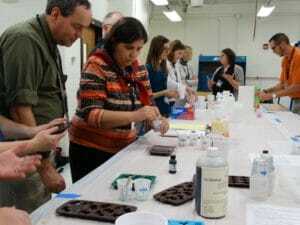 On the first day, there were hands-on sessions that included lab work in ceramics and glass, composite sandwich panels, water rockets, nanoscience and thermosets. On the second day, participants chose one of three tracks for a six hour, hands-on workshop about 3D Printing, Solids – the Science of Stuff, or Unmanned Aircraft Systems (UAS). 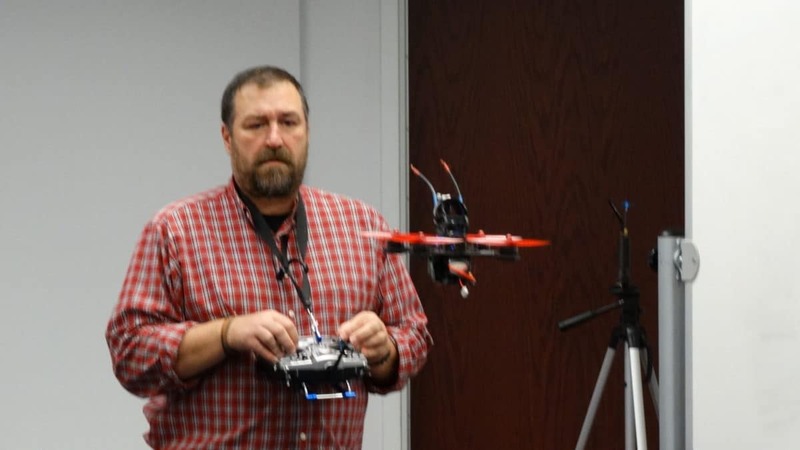 In the UAS track, participants built a drone from a kit, practiced flying it through an obstacle course and gathered data they could analyze at the same time. The UAS Intensive was presented by the Virginia Space Grant Consortium. In 3D printing track, participants were introduced to the concepts needed to design, model and print a prototype or production item. The Solids-the Science of Stuff track presented great ways to incorporate chemistry that were authentic, low cost and relevant. The entire two-day M-STEM event is designed for practical application to ensure that teachers can replicate the experiments or projects in a classroom. Dr. Darrel R. Tenney, former Director of Aerospace Vehicle Systems Technology at NASA Langley, who showcased some of the research on materials that has taken place during this 100 year anniversary period. Dr. Magesh Chandramouli shared the second keynote presentation on virtual reality for active learning that was innovative, as he explained how low cost methods can be used to incorporate VR into the student learning experience. A great example of that was setting up a clean room virtually to teach safety strategies and protocols. Students then don’t have to worry about making a mistake or having to sneeze and requiring they reset the whole environment; they just keep going. Tom Singer, Principal Investigator for the Guitar Building Project, was the lunch keynote. He gave an overview of the program and an explanation of the STEM components in the curriculum. He also shared several examples of students who have achieved better results in STEM classes as a result of their participation.